Dubbed the Philippines’ own Julia Child, Nora Daza may well be the face that represents Filipino cuisine as we know it today. Though Daza (surprisingly) did not grow up surrounded by the sort of cooking-inclined family you would imagine (even describing her mother as a “not-very-good” cook), the Pampanga native would come to develop the passion for the craft from reading through an (unused) collection of recipes accumulated by her mother before jumping into it. And what began, as magazine Positively Filipino puts it, as mere “child’s play”, would eventually have her taking up related courses at the University of the Philippines and Cornell University, New York. Daza would soon become known for her cooking shows (among which was the 80’s TV hit, Cooking It Up with Nora), judging stints, and of course, her cookbooks. 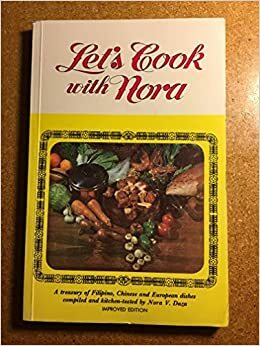 Of her written works, the most familiar a sight on many a Filipino cook’s shelf is her very first release from way back in 1969, Let’s Cook With Nora. In the book, Daza follows a straightforward way of presenting recipes—with no pictures, no lengthy descriptions, no frilly language. It is easy to dismiss it for its (frankly) dated appearance and flimsy paperback form, but don’t be fooled: Let’s Cook presents a collection of recipes unbelievably vast for its roughly 200-page body, managing to cover all bases from appetizers, soups, meats, poultry, vegetables, starches, desserts, and beverages. In many ways it parallels the US’ Joy of Cooking cooking bible—not only in that it hits all the basics, mostly traditional in execution and with an emphasis on cooking from scratch with fresh ingredients (and the said straightforward language), but also in that the entries not necessarily limited to local cuisine, instead serving as a reflection of the cooking common in households around the country at the time. Go through the table of contents and you’ll find the dishes you’ve probably had growing up: Filipino classics such as adobo and tinola, as well as adaptations of foreign gems that include beef stroganoff and fish fillets with lemon butter sauce. The book is dominated, for the most part, by all things familiar and comforting—if not overly so. But dig a little deeper and you’ll find one peculiar gem, curiously listed as Fried Milk. The said recipe intrigues for a couple of reasons, not least of which is its name. Think (or, heck, google) “fried milk” and immediately pops up is something along the lines of a deep-fried custard with roots in Spanish leche frita (to which “fried milk” is the literal translation), which has similar iterations (of the same translated name) in Northern China and Italy (or for something close to home, something along the lines of Mamou’s Crispy Milk). To these, however, this recipe bears little to no resemblance (You won’t even find it listed anywhere near the book’s dessert section—rather, it’s under “rice, noodles, and pastas”). While the recipe as written in Let’s Cook barely contains any other information (aside from being attributed to a particular “Liberty Milk cookbook”, likely referring to brand of canned dairy popular at the time), a more in-depth search reveals another dish that goes by “fried milk” but from other regions in China that involve milk, some form of meat or seafood, and egg whites stir-fried, at times served on fried noodles—and it is this “fried milk” that we’d liken the recipe found in Daza’s book. This recipe features bihon, or rice stick noodles, deep-fried to a bed of puffy “hairs” that form the recipe’s base. Daza, unfortunately, does not go into much detail about the frying process, which took us a couple of tries to get right—generally though, you’ll want to heat the oil to about 350 F and keep it there by adjusting the heat as necessary (Do a test batch with just one or two bihon strands before diving in). We prefer frying in batches just to make it easier to control the process, and for your first batch, start small and use less of the uncooked bihon than you’d think necessary—it’ll definitely grow in size. You’ll also need to watch carefully as you don’t want the fried pile to burn—finicky procedure aside though, the process is a sight to behold as the noodle pile unravels the moment it hits the oil and every single noodle swells with the teensiest of bubbles. What we presume to be the “milk” part of the equation—a mixture of fresh crab meat, cream and a mostly-egg white-comprised egg blend—is thankfully much easier, though admittedly unusual for us, resembling a savory custard crossed with a soufflé done on a stovetop. The crab is sautéed briefly, cream is stirred in, and only then are is the egg mixture poured in (which means it never gets to brown, and instead gets “poached” into the cream). The instructions don’t clarify whether the mixture is meant to be silky-smooth the way a traditional custard is (which would mean controlled stirring at low heat) or fluffy the way scrambled eggs are, but we went for the sweet spot in the middle—thick but liquid enough that it holds together as a pourable “sauce” with the whispiest “curds” of egg dispersed all throughout. Once done, the sauce is poured onto the crispy bihon, garnished with cilantro, sprinkled with sesame oil if desired, and served. As odd as the recipe sounds in theory, to us, it does render one tasty, or at least interesting, dish. We’ll admit we found the flavors a tad subdued, following the recipe to a T—it’s exactly what you’d expect from a mixture of crab, cream and egg whites, and we found ourselves either sprinkling on more salt or going aggressive with the cilantro and sesame oil to really get excited. But after a couple of forkfuls, it made sense—the allure of this dish, like many other Chinese specialties, is in the textures—of which the components offer a most beautiful contrast. The bihon takes on a crisp-but-ultra delicate character that leaves behind a crackly sensation as it dissolves on the tongue (which it does quite effortlessly); the sauce takes on a creamy consistency with the eggy curds mimicking fluffy clouds in the mouth. The “sauce” also helps moisten the fried bihon just slightly, and—if you follow instructions to mix it in just before serving to, lest the dish turns soggy—the combination of crisp, crackly, moist and creamy feels like a dynamic push-and-pull celebration in the mouth. Just keep the seasonings handy, to taste—but for the brilliant play of textures the result offers, the dish is absolutely worth a try. If you feel that the crispy noodle-eggy sauce combo is familiar, you’re not alone: Wooden Spoon’s Crab Pancit, anybody? As you’d know, the said restaurant is owned by no other than Nora’s own son (and culinary icon in his own right), Sandy Daza, who relays the dish’s story on the menu (an appetizer served at their restaurant in France, concocted by his mother and Chef Jacques Mariner)—safe to say this recipe likely served as an inspiration. Comparing the two based on our observations however, Wooden Spoon’s version—seemingly one that fuses the original with the good ol’ Filipino pancit—appears to feature a higher proportion of egg yolks to whites, or eggs to dairy, resulting in a more yellow-hued sauce; uses bits of kani (imitation crab) rather than the fresh stuff; and takes on a stronger note of MSG (not necessarily in a bad way). Both versions are great in their own right in any case—great exemplars of how the unusual—done right—can, indeed, be delicious. Heat oil until extremely hot, about 350 F.
Carefully drop bihon and fry until puffed. Repeat until all bihon is fried. Arrange in a platter and set aside. Beat egg whites and yolks together lightly. Season with salt. Set aside. In a pan, heat 3 tbsp oil. Saute crab meat in oil. Lower the flame and stir in the cream. Add slightly beaten eggs, and stir until mixture thickens slightly. Pour over fried bihon. Decorate with coriander. Sprinkle with sesame oil, if desired. Serve at once. In search for a good goat soup recipe, I stumbled upon an image from your blog. And this image has lead me to reading your blog and the recipes.. what a gold mine! Finding your blog has been the most exciting part of a cold February. Your recipes are so refreshingly unique. Your blog is worth every minute of reading. Keep up the great work! !